Our mission is to proclaim the Good News of God's grace to everyone. We think that Jesus Christ is for everybody—no matter who you are, what you've done, or where you've come from. We are glad you are visiting us. Check out our newsletter, listen to a sermon, or sign up for our weekly email. Better yet, join us on a Sunday for worship services at 8:00 and 10:00 AM. Hope to see you there! Check out our sermon podcast or stream below. Be sure to follow us on iTunes for the most up-to-date sermons. An almost forty-year-old parish, we are in the heart of beautiful Wenonah. We have two convenient services on Sunday morning, our 8 AM traditional-language service and our 10 AM contemporary-language service with music. 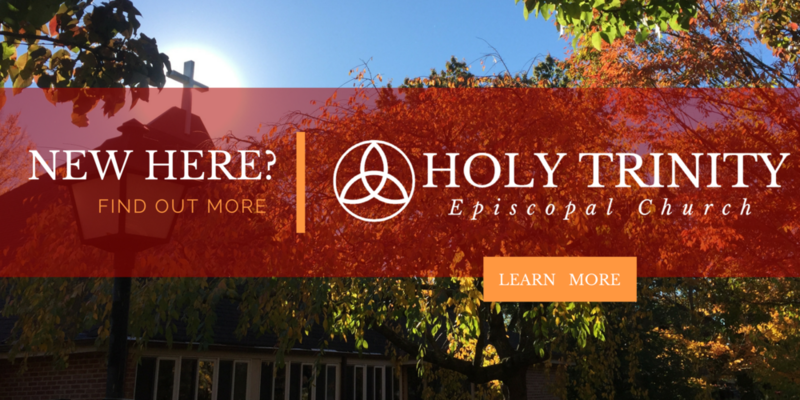 Use our secure online giving portal to give to the mission and ministry of Holy Trinity. A service where the three final instructions of Jesus are remembered: to wash feet, to love one another, to “do this in remembrance of me.” This service will feature foot-washing, Communion, and the Stripping of the Altar. The chapel will be open for prayer & vigil from Thurs. to Fri.
Good Friday is a powerful service, remembering Jesus’ passion and death for our sins, and marking the moment of his sacrifice. Note: There will be no Communion this year at the Good Friday service. The nadir of the Three Days, this short service of prayers and readings contemplates the mystery of a God who has experienced death. After the service, we will decorate for Easter services. If you are interested helping, please contact Joanne. Join us for the first service of Easter, the Great Vigil. Beginning with a symbolic lighting of the New Flame, we will hear again about God's saving work for humanity: from the creation of the world to the crossing of the red sea, to the raising of Christ from the dead! A powerful service of light and hope, we celebrate together Christ's victory over sin and death, sharing in the first Holy Communion of the Easter Season. Stick around after the service for a champagne and chocolate reception. Come celebrate the end of Holy Week and the beginning of the Easter season with Holy Trinity. On Easter, we celebrate God's triumph over sin and death through the resurrection of Jesus Christ. Come hear about this amazing miracle that changed the world forever. Everyone is welcome and invited! Be sure to stick around after the 10 AM service for Coffee Hour and an Easter Egg Hunt around the church!